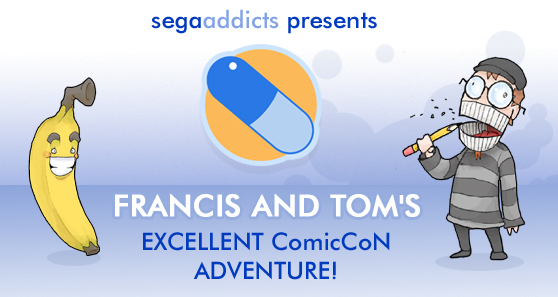 Tom Kyzivat here, resident Sega Addict and attention whore, bringing you the buzz from the New York ComicCon 2010! Now, I was only able to attend on Friday, and four hours probably isn’t enough time to really take in all the show has to offer, but what I do have I will give to you! Francis P. Tassium and I arrived in New York Friday afternoon for the show at the Jacob Javitz Center. We both agreed that the Center, in addition to having a really fun name to say, is quite an impressive building. Jacob Javitz! 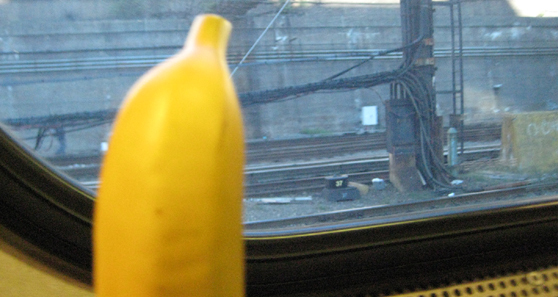 Our favorite banana arrives in the Big Apple. The first thing I noticed were the crowds. The HUGE crowds. And lots of cool costumes, like Monarch henchmen from Venture Brothers, a 7-foot tall Chewbacca (he might have even been a real wookie–still not sure), and a whole slew of anime characters that I didn’t recognize. I’m a noob. I’ll admit it. 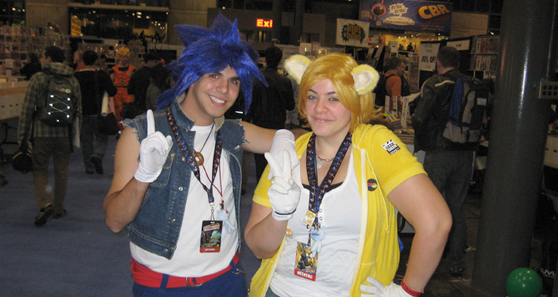 Sonic and Tails attended the Con, disguised as humans. Enough of that fluff: on to the video games! 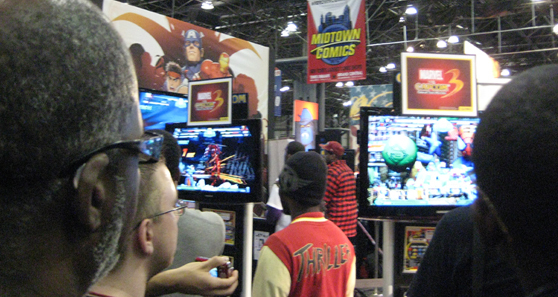 All the video game booths were insanely crowded, unfortunately, and I didn’t have time to wait in line to play Marvel vs. Capcom 3, but I did get to see some of the gameplay. THIS GAME LOOKS SO SWEET! Of course, I didn’t see anything you can’t already see on YouTube (actually, I saw less, because they just revealed three new characters this week), but it was really cool to see it in person, in full clarity. They even had a large screen set up in the center of the display, with a Capcom rep commentating on the current match, as if it were a sporting event. Or, the closest thing we nerds will ever get to participating in a sporting event. Capcom booth: HYPER COMBO FINISH!!! 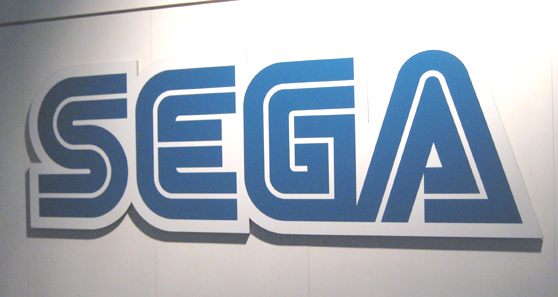 Sega had Sonic Colors, Vanquish and a demo of Captain America on display. Again, I didn’t see anything that wasn’t already revealed at Pax or E3, but since I didn’t get to go to those, it was fun to see it for myself and to “ooh” and “ahh” with the crowds. I must say, the giant hamburgers from Sweet Mountain Zone look even more awesome on a nice, big screen. Giant hamburgers are cool. Pulitzer Prize, here I come! Nintendo had a booth, too. Yeah. Jacob Javitz. Anyway, overall, as one might expect, the video game side of the Con took a noticeable backseat to the comic and TV content–or, to put it in a needlessly nerdy way, a video game hors d’oeuvre to the comic book main course. Anyway, the comic side was pretty cool, too–I found that the indie publisher tables and booths were much more interesting and friendly than the giant Marvel and DC set-ups. It was a good place to talk about art and be a geek. 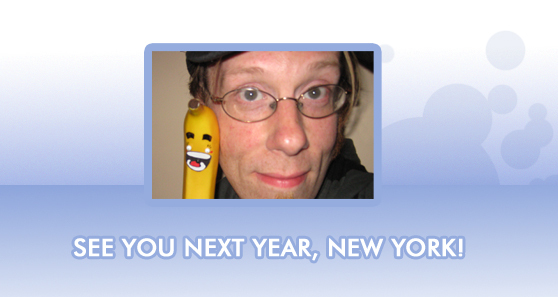 It’s too bad I wasn’t able to be there longer, but there’s always next year. …where I’ll make sure to bring more money. $3.50 for the pop machines. Yeah. That was defintely ruffling my petticoats. Anything you want to add, Francis? Fantastic. Thanks for reading! Till next time, JACOB JAVITZ! I love you, Tom. NYCC sounds like a blast! Did you meet anyone at the con that we’ve interviewed? Also, did Francis bother anyone by worshiping the dark lord? I WANT MY OWN FRANCIS. THAT IS GENIUS. @Kris: Ha, ha! I love you, too, Kris. But no, unfortunately it was pretty busy and all the reps were talking to people. If I’d had more time I could have hung around. I also totally failed on the Mega Man scoop! I’m sorry! I circled the booth and I don’t think they even had anything for it, unless I missed it somehow. From what I remember it was all Marvel vs. Capcom 3! 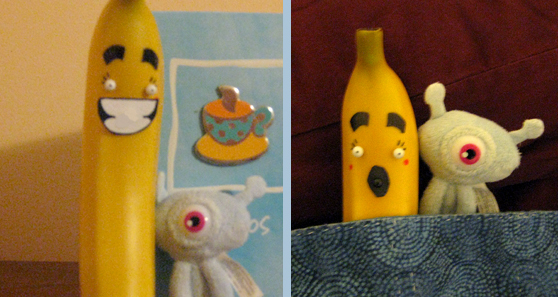 And Francis behaved, luckily. For the most part. I feel like Francis would make an excellent addition to my desk, alongside Gohan and Videl and my cars. Am I the only one who loves Francis? I hope not. There better be a Francis thread in the forums. There isn’t yet, as we’ve mainly been using the podcast threads to fanboy over him. You should go make one. Do it. Now.